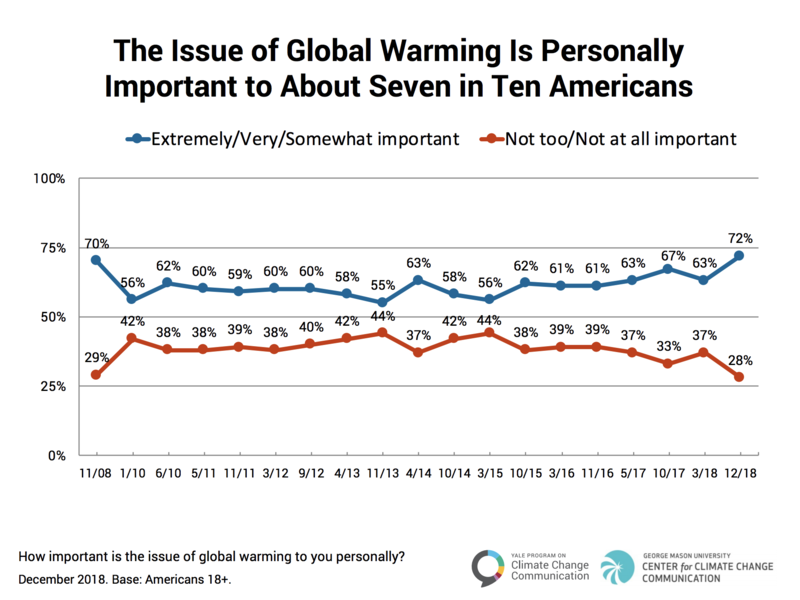 January 22, 2019 – (New Haven, CT) A new nationally representative survey finds that a large majority of Americans say the issue of global warming is personally important to them, outnumbering those who don’t by more than a 2 to 1 margin. The percentage of Americans who say global warming is personally important is now at a record high (72%), up 9 percentage points since March 2018. “After a year of devastating extreme events, dire scientific reports, and growing media coverage of climate change, a record number of Americans are convinced that human-caused global warming is happening, are increasingly worried, and say the issue is personally important to them,” said lead researcher Anthony Leiserowitz, PhD. of Yale University. 62% of Americans understand that global warming is mostly human-caused (+4 points since March 2018). By contrast, a record low 23% say it is due mostly to natural changes in the environment (-5 since March 2018). 65% think global warming is affecting weather in the United States, and 32% think weather is being affected “a lot”. About half think global warming made the 2018 wildfires in the western U.S. (50%) and/or hurricanes Florence and Michael (49%) worse. 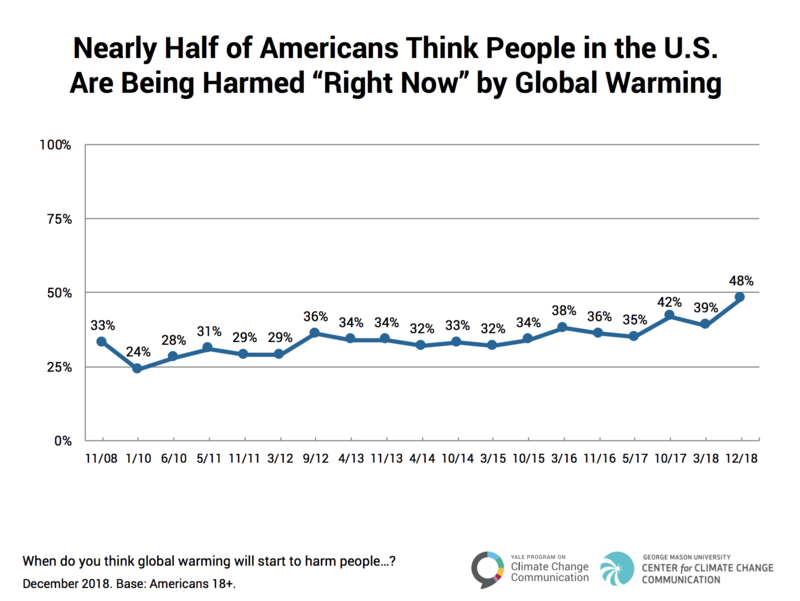 These findings come from a nationally representative survey (Climate Change in the American Mind) conducted by the Yale Program on Climate Change Communication and the George Mason University Center for Climate Change Communication. The survey of 1,114 American adults, aged 18 and older, was conducted November 28 – December 11, 2018 on the Ipsos KnowledgePanel. In addition to Drs. Anthony Leiserowitz and Edward Maibach, principal investigators included Drs. Seth Rosenthal, Matthew Ballew, Matthew Goldberg, and Abel Gustafson of Yale University and John Kotcher of George Mason University.